Whenever I visit a congregation, I like to play Stump the Bishop. Ask me whatever you want, and I’ll do my best to answer. What question would you ask? What question would you ask? The best questions come from confirmation students. One wanted to know how much I get paid to be bishop. I explained that, about once a week, Cathy puts a $20 bill on my dresser, and I get to spend it on whatever I want. So, as far as I can tell, I get $20 a week to be bishop. Another student asked how many bishops there are and what my rank is. There are 66 bishops, Presiding Bishop Eaton is the first among equals. If you measure rank by whether the presiding Bishop comes to your assembly, then I am in the top four. And if you measure rank by how frequently a bishop is invited to come to the churchwide offices in Chicago, I suspect I’m sixty-sixth. I take solace in an often-overlooked textual variant of Luke 9:48. Jesus said, “For the least among all of you [in the Conference of Bishops] is the greatest [in the kingdom of God].” Is she laughing? A third student wanted to know who my boss is. I quickly answered, “Jesus because Jesus called me to this office. 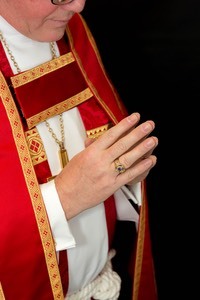 When the student pressed, I said, “The synod assembly who elected me bishop and who will have the opportunity to do–or not do–that again in just about a year.” The student wasn’t satisfied, like many of the people who call the synod office asking who my bosses is. They want to know who has authority over me, who they can appeal my decisions to, who they can lodge their complaint with, who they can call to get me fired when I refuse to get rid of their pastor. For a little while, enough people were calling the churchwide office that Secretary Boerger asked me to tell them to call him, so he could bewitch them with constitutional brilliance on the structure of the ELCA and spare Bishop Eaton who has more important things to do than field complaints about Bishop Satterlee. Is she laughing? These students’ questions reveal what we believe to be the answer to the question I am most frequently asked. This question takes on many forms. What must we do to get more members? To get more money? To attract young families? What must we do to secure our church’s future? In answering this question, how naturally even we cross-marked, Spirit-led, church-going Lutherans rush to determine worth, rank, and power. And how naturally we assume the church works this way. We attempt to prove our congregation’s worth in terms of income and attendance or, when that isn’t helpful, by how much we function as a family and are devoted to our building. We obsess over who possesses the power–pastors versus the people; large churches versus small. We assume the synod is over the congregation and Chicago is over the synod, and way up there at the tippy top sits Presiding Bishop Elizabeth Eaton, living a Vatican-like existence with the ELCA curia on the 11th floor of the churchwide offices. Is she laughing? As we, Christians and Church, strive to determine worth, rank, and power, we find ourselves confronted by the feast of the Holy Trinity and the good news that our God does not–and Christ’s Church ought not–play by these rules. The three persons of the Trinity–the ones the Church historically calls Father, Son, and Holy Spirit–do not relate to each other and the triune God does not relate to us by determining who is worth the most, who ranks the highest, and who wields the most power. We see this in the much-maligned Athanasian Creed, which we “accept, teach, and confess” and which disappeared from our worship book. You can find it online. In the congregations where I served as pastor, we marked Trinity Sunday by reading it together as poetry rather than canon law, in much the same way we read the poetic parts of sacred Scripture. Rather than worth, rank, and hierarchical power, the Athanasian Creed proclaims: “Nothing in this trinity is before or after, nothing is greater or smaller; in their entirety the three persons are coeternal and coequal with each other.” This is the life of the Trinity. And more. This is the eternal life for which Jesus was lifted up from the earth, the life into which our triune God welcomes us through our baptism into Christ. The Spirit blows where it wills to bring us and the world into this life–the life of the Trinity, the way the world will be when all things are restored to the life the Father intends. Not before or after. Not greater or smaller, but coeternal and coequal. This is the life that God in Christ frees and empowers us, the world, and especially Christ’s Church to live. With Nicodemus, we are baffled. With Nicodemus we ask, “How can these things be?” How do we relate, how do we function, how do we live without determining worth, rank, and power? The life of the Trinity, the life the Trinity wills and wants and welcomes us to live, is as far from us as Isaiah’s vision of the Lord sitting on a throne, high and lofty, the hem of his robe filling the temple, and six-winged seraphs flying all around. We know that pursuing worth, rank, and power get us nowhere, especially compared to what Isaiah saw. In fact, worth, rank, and power get us in trouble. We know ourselves to be people made unclean by our pursuit of worth, rank, and power, who live among people made unclean by their pursuit of worth, rank, and power. When Jesus answers, “Be born from above. Be born of the Trinity,” we don’t like it. Being born is not so much something a baby does as something that is done to a baby; the baby is not in control. And we want to be in control. Besides, while babies are precious, in worldly terms, newborns lack worth and rank and power. Newborns are helpless. Newborns are vulnerable. Newborns are dependent. That’s what it means to be born. Do you suppose the Trinity is birthing a new church? Jesus answered, "Very truly, I tell you, no one can see the kingdom of God without being born from above." This is the life we–Christians and the Church–are invited to live when our triune God births us in the waters of baptism– a life totally dependent upon God. This is the life for which our risen Christ strengthens us when he gives himself to us in the bread and the cop–a life totally dependent on God. “For God so loved the world that he gave his only Son, so that everyone who believes in him may not perish but may have eternal life.” If eternal life is totally depending upon God, could it be that believing in Jesus is not so much getting your doctrinal house in order or anything we do? What if believing in Jesus means trusting Jesus, depending on Jesus, to do–for us, for the church, for the world? What if believing in Jesus means following Jesus rather than chasing after worth, rank, and power? I suspect we would know freedom, hope, and joy. I suspect we would abandon our despair, let go of our fear, even our fear of the death of the church that we’ve known and the world that seems to be unfolding before our eyes. St. Paul writes that we “did not receive a spirit of slavery to fall back into fear, but we have received a spirit of adoption. When we cry, "Abba! Father!" it is that very Spirit bearing witness with our spirit that we are children of God. And if children, then heirs, heirs of God and joint heirs with Christ.” In other words, we live the life of the Trinity. Whatever question you want to ask the bishop–that bishop not me, whatever question nags at your spirit or causes your heart to ache or paralyzes your congregation in fear, whatever question you want to ask, I have a hunch the answer begins: “Dare to live the life of the Trinity.” Amen.